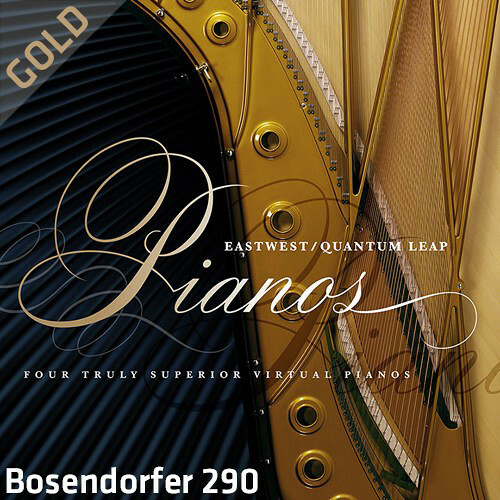 Available for download, the EastWest Quantum Leap Pianos Bosendorfer 290 Gold Edition is a virtual piano that samples a 98-key, 9.6' Grand Imperial Concert Grand. The piano itself has a warm, dynamic, resonant, and romantic tone. The extended low range gives body to the sound that you can't get from a traditional 88-key piano. Even the patches that only utilize 88 keys benefit from the resonance the extra ten keys provide. The gold edition offers 16-bit samples, rather than the 24-bit samples provided in the Platinum version. It also provides you with a single player-perspective microphone position. All of this is useful for people who have slower computers. Samples are triggered and played through the accompanying PLAY software, a 64-bit audio engine that powers the EastWest Quantum library. This software is compatible with Mac and Windows platforms and operates in AU, AAX, and VST formats.